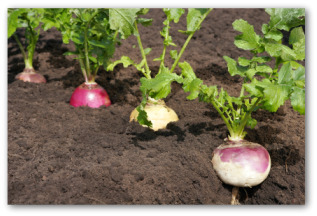 Need some easy tips for planting turnips in your backyard vegetable garden? Learn how to plants, care for, and harvest turnips when home gardening. 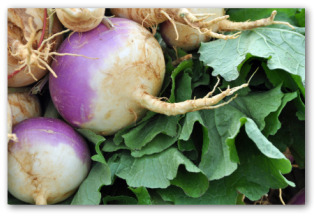 Turnips are a cool-season vegetable grown for their edible roots. Growing turnips is a better choice for small gardens other than growing rutabagas. The roots of the white turnips are smaller and mature much faster than rutabagas. The turnip variety 'Tokyo Cross' requires only 35 days to produce round white turnips that can be used like radishes. Immature turnip tops are frequently used as greens and can be frozen or canned. 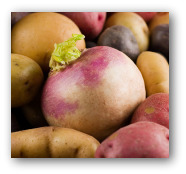 Growing turnips originated in western Asia and around the Mediterranean in prehistoric times. Although there are white and yellow forms, most turnips are white-fleshed. Turnips have rough, hairy leaves, are fast-growing, and get pithy in a short time. The crops do well in both spring and fall plantings, maturing in 60 days or less. Turnip crops require full sun exposure. Sowing turnips in average garden soil is fine as long as the site is free from rocks or other obstructions. The seedbed need not be extremely fine because seedlings come quickly and easily and the enlarged roots are borne partly out of the ground. Plant turnip seeds in early spring and again in midsummer. Sow turnip seeds about a half inch deep in rows 15- 18 inches apart. Thin seedlings to 3 inches apart. Water plants during dry periods. Keep the crops well-watered and rapid growing for best quality. ‘Purple Top White Globe' is a standard variety for roots that is ready for harvest in 58 days. ‘Just Right' is a white hybrid for greens or roots that can be harvested in 37 days. If plants are grown too long during hot, dry weather, the roots will be woody and maggot ridden. Turnip plants prefer cool weather seasons. The turnip's short season permits it to be grown, at some time, everywhere in the United States. Cabbage worm can also be a turnip pest as well. Rotate gardening areas each year for growing turnips to avoid soil-borne problems. To avoid the over-sized, tough roots often found in supermarkets, begin to harvest turnips when they are less than 4 inches in diameter. Harvest produce before freezing temperatures arrive. 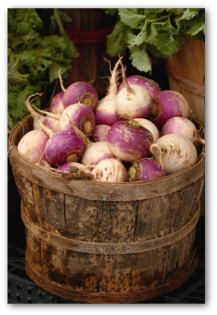 Turnips can be stored in damp sand inside a root cellar or cool basement. Use turnip greens when they are young and tender as thinned plants. Turnips are at their best when only a couple of inches in diameter. They can be kept for a time in cool storage of root-cellar conditions. Since root cellars are not available to the majority of gardeners, turnips do freeze well. We recommend freezing a surplus by first blanching them with boiling water, and either cutting them into slices, diced, or whole. Planting turnips provides you a vegetable dish to complement many other foods, especially meats, sausage, chicken, and fish. Turnips can be served as a puree, made into soufflés, or cut into little flowerettes. Other serving ideas are to cook turnips in broth, cut into cubes and boil, or serve steamed with butter, salt, and a touch of garlic. The root can be baked alongside a roast in its drippings, in stew, or included in homemade vegetable soup. If you have self-declared turnip-haters in your home, try this experiment. Cook young turnips, drain, puree them very smoothly in a blender, and beat them together with an equal quantity of mashed potatoes, using the usual butter, salt, and pepper. Serve this with roast turkey and take in all the compliments before disclosing the secret ingredient!